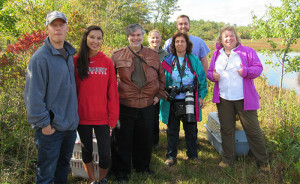 Two Gray foxes rehabilitated and released back into the Wild at Woodford Cedar Run Wildlife Refuge, in Medford, NJ. « Meadowlands rare bird sighting – The Ruff. 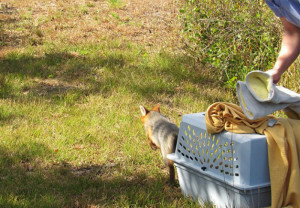 Less than a month ago, on Thursday October 6, 2016, my husband Bob, and I, had the opportunity to witness an actual “3R” (Rescue, Rehab, and Release) of two Gray Foxes – one male, one female (at least the “Release” part). 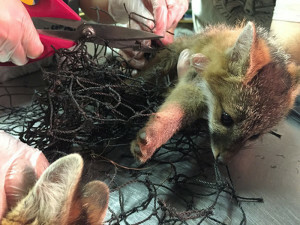 These orphaned baby foxes were found, tangled up in a soccer net, severely dehydrated, with the male sustaining an injury with a gash on its leg, and brought to Woodford Cedar Run Wildlife Refuge back in June 2016. The “Release” was over in a FLASH, but well worth our 2 hour drive (each way). Kudos to the Woodford Cedar Run Wildlife Refuge which continues its mission in preserving New Jersey’s wildlife and habitats. 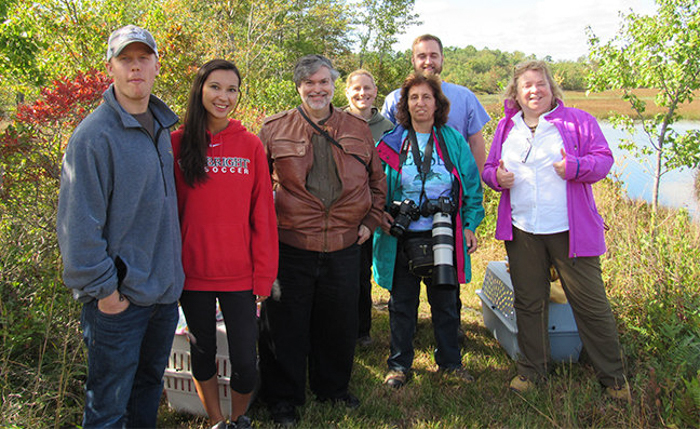 Be sure to read the article below, by Kathleen Brust of Laura Bishop communications, which beautifully, yet succintly, describes the foxes’ release, as well as the history and mission of Cedar Run Wildlife Refuge, situated in Medford, New Jersey. MEDFORD — When the doors on the cages were opened on Oct. 6, the female gray fox took off immediately, running for the shelter of the trees in the private land near the Wharton State Forest. 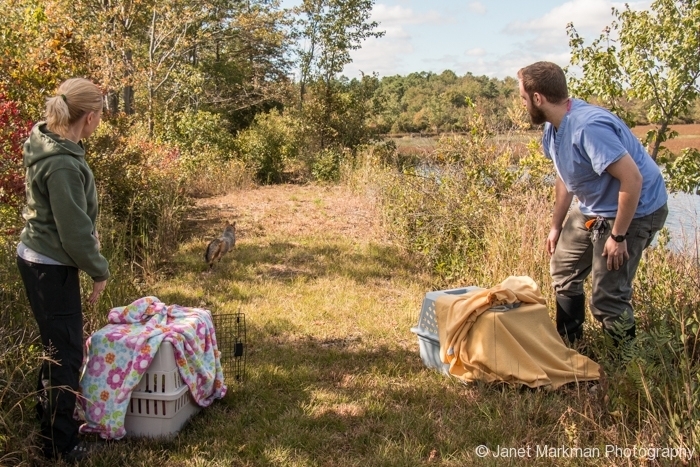 The male fox hesitated, and it wasn’t until Woodford Cedar Run Wildlife Refuge Assistant Director of Rehabilitation and Volunteer Coordinator Mike O’Malley tapped on the crate that the fox trotted off on the same path as his sister. Both were seemingly ready to take on the Pinelands and old cranberry bogs in the area. But this definitely was not the case back in June, when a Medford homeowner found the two foxes struggling in his backyard soccer net and took them, still in the net, to Cedar Run’s Rehabilitation Hospital. Then, the foxes were extremely dehydrated and the male had a horrible gash on one of his front legs, according to Lori Swanson, Cedar Run Director of Wildlife Rehabilitation. Swanson said the gash on the male fox took a month or so to heal. “The skin was so damaged that we could not stitch it immediately,” explained Swanson, “and the vets at Animal & Bird Health Care Centers had to perform a secondary closure after it had healed on its own for a bit.” She said that both of the animals had been on pain medication to deal with any inflammation from being bound-up for so long. “There is a lot that goes in to rehabbing animals like these foxes,” explained Jeanne Gural, Cedar Run’s Executive Director. “As soon as they could, they were moved to an outdoor enclosure. They are handled and touched as little as possible.” Gural said all of this is to aid in their ability to be released back into the wild successfully. She said the fox spent about two months in the outdoor enclosure honing their skills for release. Ensuring that the foxes can be released back into the wild is critical to the work at Cedar Run, said Gural, which was founded in 1957 by Jim and Betty Woodford, who became a local authority on New Jersey Pinelands flora and fauna. The Woodfords devoted the next 40 years to Pinelands preservation, environment education, and wildlife rehabilitation. Gural said Betty Woodford became an expert botanist, naturalist, nature photographer, and wildlife rehabilitator. The Woodfords’ ultimate dream was realized in 1997, when their family, along with a Green Acres grant, preserved Cedar Run’s land – 171 acres – and buildings for future generations. Jeanne Woodford, Refuge President, continues her parents’ work today, according to Gural, ensuring that the environmental education, wildlife rehabilitation, and habitat conservation continues. On the day the fox were released, Gural, Swanson, and O’Malley were joined by two couples who had won the opportunity to participate by bidding in two different auctions. Bob and Janet Markman had driven down from Caldwell, to witness the event; the Markmans had bid on the opportunity, donated by Gural, at an auction to benefit EarthShareNJ. Mike Southwick and Ali Brett were there because Southwick’s father, Michael, had bid on the opportunity at Cedar Run’s annual “Whiskey, Wine and Wildlife” benefit. Such activities — auctions and benefits — are crucial to Cedar Run, which receives no local, state, or federal government funding. This entry was posted in Nature Preserves.